What did Castracollis look like ? One of the recently discovered species, Castracollis  (which is the Latin equivalent of Castlehill, a farm near Rhynie), has been regarded as "one of the most important recent discoveries that bear on the elucidation of branchiopod evolution" . Its tentative reconstruction in  involving a hypothetical carapace (shield) is based on only one lump of chert, hence any new finds deserve attention since they may show other details. 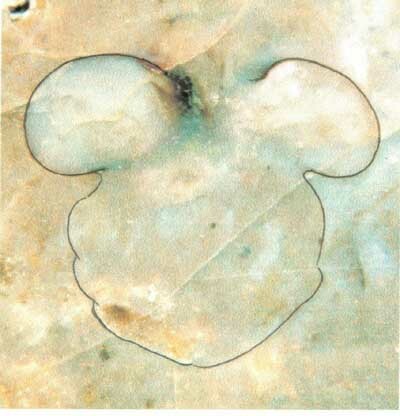 A piece of chert found in 2003 revealed several specimens of Castracollis on the surface and on cut faces, among them the one seen below as a cross-section of the anterior part of the body. 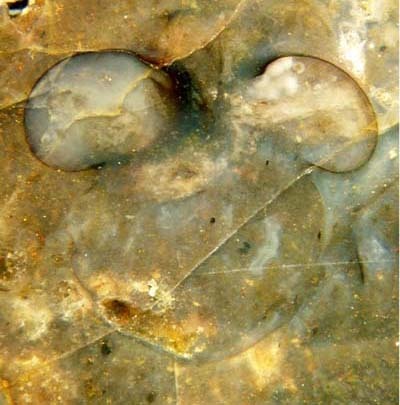 As a conspicuous feature, what seems to be the carapace is divided into two bulging halves, which does not fit to the reconstruction proposed in , see Fig.3. This lack of compatibility is presently being considered by D. Waloszek at Ulm University. Eventually the present find will lead to a slightly modified reconstruction of this lately discovered crustacean. Trans.Roy. Soc. Edinburgh, Earth Sci. 93(2003), 355-382. Trans.Roy. Soc. Edinburgh, Earth Sci. 94(2004 for 2003), 355-369.